A representative high-resolution temperature response curve of respiration. I focus on temperatures that are most commonly experienced by canopy species (10-45˚C). Plant respiration is one of the least constrained aspects of the terrestrial carbon cycle, and accurate representation of respiration in similuation models of vegetation carbon cycling is crucial to understanding how plants and ecosystems will respond in a warmer world. The temperature response of respiration is often modeled with an exponential equation where rates increase by a factor of 2 across an increase in 10˚C (where Q10 = 2), however it is now understood this does not accurately portray how this process occurs. The goal of this research is to provide empirical, wide-reaching data that accurately represents how respiration responds to temperature so that models can better integrate this large flux of carbon. My postdoctoral research at Australian National Univeristy working with Owen K. Atkin (collaborators including Peter Reich of University of Minnesota, Mark Tjoelker of University of Western Sydney, and Chris Huntingford of the Centre for Ecology and Hydrology at Wallingford) focused on the temperature response of leaf dark respiration, and how this response compares amongst species across the globe representing diverse biomes and plant functional types. As a part of this research, I led field campaigns in temperate and boreal forest species in the Hudson Valley, NY, northern Minnesota, and northern Sweden. Findings from the global study were published in PNAS in March 2016, and will hopefully be easily implemented into models of ecosystem, regional, and global carbon cycling. Darkened leaves were warmed continuously at a rate of 1˚C min -1 across a wide temperature range using a peltier-controlled whole-leaf cuvette. Collaborative work with Chris Huntingford at the Centre for Ecology and Hydrology at Wallingford is providing an opportunity to test the utility, applicability, and impact of our response terms in a global dynamic vegetation model (JULES). 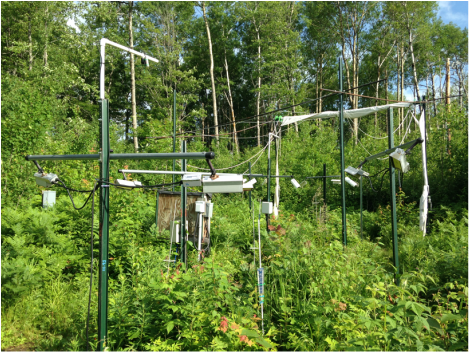 Current work is probing into how this new approach alters plant-level carbon fluxes in multiple sites around the world between the measurement years of 2010-2014 via simulation. To determine if these responses are altered by warming and drought, I am working with Owen Atkin (Australian National University) and Peter Reich at the University of Minnesota, measuring the temperature response of respiration in southern- and northern-ranged deciduous and evergreen tree saplings at the B4WARMED site in Cloquet, MN. Heskel MA, Greaves HE*, Turnbull MH, O'Sullivan OS, Shaver GR, Griffin KL, Atkin OK. Thermal acclimation of shoot respiration in an Arctic woody plant species subjected to 22 years of warming and altered nutrient supply. Global Change Biology, 20 (8): 2618:2630.